Halogen ovens use a halogen lamp as a heating element, thus proving much more energy-efficient than conventional ovens and faster, significantly reducing the cooking time. Halogen ovens cook up to 40% faster, without having to preheat, they are easy to clean and use, require petty maintenance and take little space. 2-YEAR MANUFACTURER'S WARRANTY - Shop with confidence. Your Andrew James Halogen Oven is covered by a 2 year manufacturer's warranty. With so many traits, it strikes as no surprise that halogen ovens have become so popular recently. Check out our five best picks for 2019 and discover the one best suiting your needs and budget! Picking the first product for our list is never easy, but we can certainly tell you this one was not so difficult! The Andrew James 12L Digital oven is easy to use, and with its several, pre-sets helps even the most ignorant cook to cook healthy and economically. However, what really distinguishes it from its competitors is its digital control panel mounted at the top. Compact and lightweight, even for carrying it with you during your holidays, the Andrew James 12 Litre Halogen Oven is designed to cook a vast range of foods, from roasts to rice and chips to cakes, while making both cooking and cleaning easier and faster than ever. The first thing one notices in its design is its 12-litre capacity – easily covering the needs of a medium-sized family – and the hinged lid, which, first of all, it negates any need for an additional stand holding the lid while the oven is still hot and you need to check on your cooking. Sure, you won’t be able to tuck it under a cupboard, but its shape and dimensions will quickly find a place somewhere on your kitchen top. Note also that this particular oven comes with an extender ring that further increases its overall capacity by 5 litres, making cooking for friends and relatives equally easy, fast and inexpensive. This feature is hardly found in any of its competitors, so do take it into consideration. Moving on, you will notice the oven’s impressive digital controls, which are actually its most distinguishing trait, making cooking easier and faster, even for inexperienced cooks. First, check out its pair of LCDs: there is one on the left, used as a timer, settable to as much as two hours, and another one on the right indicating the cooking temperature, settable up to 250°C – which is more than you will ever need. Both come with their corresponding + and – buttons, making settings much more precise than analogue twist dials usually found in its competitors. Even more handy features can be found on the base of the oven: there is a series of buttons providing easy access to standard cooking programs and cleaning functions, designed to make cooking and cleaning a breeze, even for students who haven’t touched a cooking device again in their life! Just pick the food you wish to enjoy, set the proper temperature, and leave the rest to your smart oven. Attention! The first time you plan to use the oven, leave it first for at least an hour at room temperature, allowing to acclimatise and thus averting possible damage to the unit. Once you have your settings in order, pushing the start button is all you need to do. If you notice anything wrong with your set options, just use the respective “cancel” button. As soon as your meal is ready, let the device cool off, set it on an automatic clean cycle and use it to sterilise the accessories you may have used during your cooking. The oven will do most of the cleaning my itself while you enjoy the “fruit” of your efforts! The cleaning cycle requires a certain amount of cold water and some proper liquid detergent. Place the used accessories inside, and the whole lot will soon be as clean as crystal before you know it! Like all halogen ovens, the Andrew James model requires almost the halftime to cook an average meal than conventional ovens, while consuming around 0.9 kWh at 2000oC, saving you a lot on electricity bills. Also included, aside from the manual, there is a mini cookbook, presenting a number of dishes with step-by-step instructions to get you started. Still, it does require some prior knowledge of cooking. The Andrew James 12-liter halogen oven is the first pick of our list for many good reasons. Making roasting, steaming, frying, boiling and baking easier than ever, it also reduces the time and energy cost of your everyday meals, it is highly portable and helps those with limited cooking experience with its pre-sets. That is why the only fault we could find was its accompanying recipe book. Everything we have already mentioned as to fast and economical cooking applies to all the picks in our list, so from now on you should take them for granted. The Elgento E14020 is another prime example, cooking a whole chicken in less than half an hour and your favourite pizza in around 10 minutes. Even smaller than our first pick, but of equal capacity (12 litres), the Elgento E14020 needs less than traditional cooking methods, further reducing the overall cost of your meals, while allowing you to grill, bake, boil, defrost and even roast, covering the needs of you and your family easy and fast. Combined with the brand’s excellent reputation, regarding both its customer service and quality of products, these traits make E14020 a fantastic pick for couples and small families. Its durable, transparent glass cooking bowl and lid dominate the whole design of this compact oven, making easy cooking inspection its first priority, and portability its second. Unfortunately, we do not have a hinged lid here, so you have to be careful when it is hot. On the other hand, it can easily fit under a cupboard on your kitchen top. Simple to use – you will figure most its modes out by yourself without even having to read the manual -, it has the temperature dial in its base, along with a 1-hour timer and a handy defrost setting – ideal for busy moms and dads or couples with heave schedules. The Elgento Halogen Oven has managed to take the halogen cooking technology a step further, featuring an even heat distribution and properly cooking the ingredients from all possible angles. Requiring a limited amount of oil, or even none, depending on what you are cooking, our Elgento oven is perfect for those among you who wish to stick to a healthy lifestyle. Among its additional accessories, you will find a cooking rack, designed to help you cook entire meals in one go. Coupled with its extremely generous 12-litre capacity, it certainly caters for the needs of 4-member family. If you need to prepare a larger quantity though, you will have to refill it, since there is no extender ring. Quick and inexpensive, the Elgento E14020 halogen oven, with its 12-litre capacity and simple use and operation has all you may possibly need to prepare healthy meals for you and your family, despite your heavy everyday schedule. We move to the first fryer of our list, the Daewoo halogen air fryer. Mastering a 1300-watt output, it promises fast and efficient cooking for large families and hospitable cooks! Other great features include a handy inbuilt 60-minute variable, an adjustable temperature control, and – most importantly – its excellent self-cleaning function. This cute and compact fryer wins your heart and mind the instant you cast your eye on it. Its 1.7-litre bowl from durable glass stands on a handy base with handles that allow you to move it around at will, even when the bowl’s surface is scorching hot. On the top of the bowl, you will find the handy set of dials, one for setting the time (on the left), and the other for the temperature (on the right), as well as two light indicators for power and heat. Again, there is no hinged lid, so you need to be cautious every time you need to check on your food. Highly efficient, both in terms of cooking and energy consumption, the Daewoo Deluxe Halogen oven boasts might, with a powerful 1300 Wattage and a high-performing fan, ensuring excellent heat circulation and cooking of any ingredient whatsoever. Tested and proven 75% more efficient than traditional ovens, you get to enjoy perfectly browned and succulent culinary dishes that are evenly cooked. What is more, it has a timer and variable temperature controls to give you more control of your cooking. Another returning feature in this model is the self-cleaning mode: as soon as you are done, let it cool off and then press the corresponding button. The machine will get washed be ready for use in a matter of minutes. Last, we have a number of accompanying accessories, designed to help your cooking and make things simpler. They include an extender ring, which can further increase the overall capacity of the device, the lid stand, an oil spray bottle, a pair of nice mesh trays, a high and low rack, and a set of tongs. The Daewoo Deluxe 1.7L 1300W Halogen Air Fryer is a mighty oven that will cater to the needs of a couple or a person that needs quick, efficient and cost-effective cooking, and hate washing up after brunch or dinner. Sure, it could use a hinged lid, but, at that price, such a con can easily be overlooked. 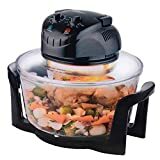 Our next pick from Russell Hobbs is another great example of how efficient a halogen oven can be, even for large families or cooks who love to prepare meals for big parties. Enabling you to cook anything you may wish while saving you from the trouble of using all sorts of pans and the scrubbing that usually follows. Russell Hobs’ flagship cooks faster not just than conventional ovens, but also than a great number of its competitors. Combined with an elegant design, numerous features and a monstrous final capacity of 16 litres, this one is just perfect for big families and busy cooks. Boasting a powerful 1400-Watt rating, Russell Hobbs’ halogen fryer has already gained a reputation for its efficiency, cost-effectiveness and handy features, especially its defrost setting, saving you time from prepping frozen meats and fishes. Its initial capacity is already big – around 11 litres – this particular model comes with a 5-litre extender ring, allowing you to cook both small and large amounts of food in a single round. Another great feature is its generous temperature range, starting from 125o C to 250o C, which enables you to try all sorts of recipes and cook anything, from very simple to rather demanding ingredients. Note that the oven is designed to bake, roast and grill all types of food tastefully and succulently. Last, we must mention the handy 1-hour timer, which averts any danger of burning your meal accidentally or overcooking your food. On the contrary, it will let you know as soon as it is ready to be served, making sure that is everything is done according to the recipe or your precious cooking experience. Note also the Russell Hobbs halogen oven comes with some handy accessories, including a great reversible rack, allowing for different levels of cooking and affording the oven unique versatility. Drawbacks? The usual one that is no hinged lid, and the lack of a self-cleaning mode. Something would have to be missing though to explain its fantastic price. Some may find it a bit heavy but do remember that it is by far the halogen oven with the largest capacity in our list. The Russell Hobbs halogen oven is the one with the largest capacity in our list, and, despite its lack of a hinged lid and self-cleaning feature, it encapsulates all that is great in halogen ovens, with cooking versatility being by far its most distinguishing trait. Closing our list, we have the latest model of the VonShef halogen ovens, designed to cater to the needs of the modern amateur cook and demand for speed, low cost and cutting-edge heating technology. 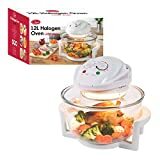 This excellent multipurpose cooker amalgamates all the traits of the convection heating technology with that of the halogen oven, affording the user amazing cooking versatility and a perfect cooking experience, regardless of the meal you are preparing. Our last model, like our first one, features a hinged lid, which is always a great addition, even in this case, since some have complained that its use can get a bit… dodgy. We, on the other hand, had no trouble using it while cooking every time we need to check the food or add an ingredient, and we never had to use our hands to remove it. With a power rating of 1200 – 1400 Watts, this model is a bit bigger from all our previous picks, with an imposing design of 48 by 34 by 32 cm – featuring a built though that is much more robust than most of its competitors. Practically this means that you had better have some space on your counter if you plan to lay your hands on it. On the other hand, its charming black-coloured design will do more than just blend in with the rest of your kitchen – it will make it look prettier. VonShef’ mighty halogen bulb and lightwave technology deserve a special mention since they ensure even heating and cooking, regardless of the preferred type of food, and at surprisingly fast rates. There is a high-performance fan integrated, designed to circulate the hot air so efficiently that negates any need to turn your main ingredients around and minimising energy consumption while expediting the cooking process. Another great trait is the self-cleaning function, which proves when used according to the given instructions, surprisingly fast and efficient. A few words about the impressive list of accompanying accessories are in order. Along with the oven, you get an array of handy tools that will make your life in the kitchen much easier and more joyous, including: a silicone protector, a rice bowl, a steamer, frying pan, three racks – one of which is specially designed for bread -, two tongs and no less than four skewers. Offering the best possible combination of halogen and convection heating technology, and equipped with a hinged lid and self-cleaning function, the VonShef Halogen Oven will cover your needs for healthy meals with all your favourite types of food and ingredients. Halogen ovens are the future of healthy cooking. Why not embrace it now and save yourself time, money and calories?